"1968 just happened to be the year that everything came together. And yeah, I was in a zone." It is admittedly a clich� to observe that baseball is a game of numbers, but more than any other sport, it lends itself to quantification�most sports fans couldn't tell you accurately how many touchdowns Dan Marino threw for, say, or Kareem Abdul-Jabbar's all-time points total, but there are numbers in baseball that have an almost incantatory power: 56. 511. 4,256. .406. This DVD offers a nice and peppy look at some of the most memorable, and offers contemporary ball players a chance to reflect on the gargantuan achievements of some of their predecessors. Roger Clemens is your host, and he's affable, a good sport as he gets his Letterman on with a top ten of baseball achievements. It's kind of a nice setup, actually�a look at each of the records, followed by speculation on if it could be broken, and if so, by whom. Nolan Ryan's all-time strikeout mark (5,714) leads off, rousingly endorsed by former Texas Rangers owner George W. Bush; the fairness doctrine is at play, because next Bill Clinton admires Cal Ripken's streak of 2,632 consecutive games. (One sour note: in a graphic, the word "consecutive" is misspelled. Oop.) It's kind of a shock to see Pete Rose in an official production of Major League Baseball, but there he is with his 4,256 hits, along with a couple of candidates who could break it (the left side of the Yankees infield; Ichiro). 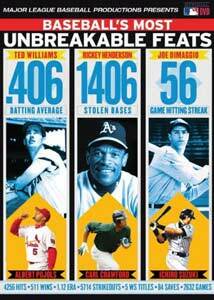 My nominee for most unbreakable is next: Cy Young and his 511 wins. Clemens has had a legendary career, but he'd have to pitch at a high level well into his sixties even to approach this. 1941 is one of baseball's magical years, bringing both Ted William's .406 batting average and Joltin' Joe's 56-game hit streak, both of which have been safely unchallenged for almost seventy years; in the steroid era, Bob Gibson's 1.12 ERA for the 1968 season is the stuff of Strat-O-Matic and video games only. Rickey Henderson is on hand to remind us that he is the greatest of all time, with 1,406 career stolen bases; Eric Gagn�'s streak of 84 consecutive saves is impressive, but does it rise to this level? And the only team accomplishment on the list is the five consecutive World Series won by the Yankees, from 1949 to 1953. The disc wraps up with the results of a players' poll of the top ten as to which is the most impressive record�the point of this and any other baseball discussion is of course not to reach a definitive answer, but to kick it around with your buddies a little bit. And in our time of instant sports amnesia, with yesterday's SportsCenter highlights going the way of Tris Speaker, it's a pleasure to see today's best players show some veneration for the history of the game. Image Transfer Review: The transfer is clean, but a little too hyped up, perhaps�brightness could have been toned down a bit here. Audio Transfer Review: An unremarkable transfer; some of the interviews were recorded with superior audio quality than others, but it's all pretty clear. Extras Review: Four featurettes (23m:48s in all) take a look at the last records not to make the top ten cut, leading with Hack Wilson's 191 RBIs in a season and Orel Hershiser's 59 scoreless innings. Fernando Tatis's two grand slams in the same inning of the same game off the same pitcher is more of a historical curiosity, really�and pity poor Chan Ho Park�though there's no denying the week that Johnny Vander Meer had in 1938, when he threw consecutive no-hitters. A brisk and enjoyable look at ten of the most impressive feats ever achieved between the white lines.